The ground was bumpy since we were sleeping on tufts of grass but our inflatable pads made for a decent bed. We bargained for another 5 minutes when the alarm went off at 5:15, then another 10 minutes. At 5:45 Andy deflated his pad- the hallmark sign that it is time to get moving. We have a system now. Andy stuffs his sleeping bag and rolls up his sleeping pad while Laurie soaks up the last few moments of coziness. Then Laurie does the same while Andy goes out to fetch our Ursacks. When he returns we either pack our own bags, or lately, Laurie packs both while Andy eats breakfast. Typically, in Andy’s absence, Laurie positions herself in the middle of the tent making it difficult for Andy to organize his things. So, either Laurie moves or she packs his bag. We were on the trail around 7am. 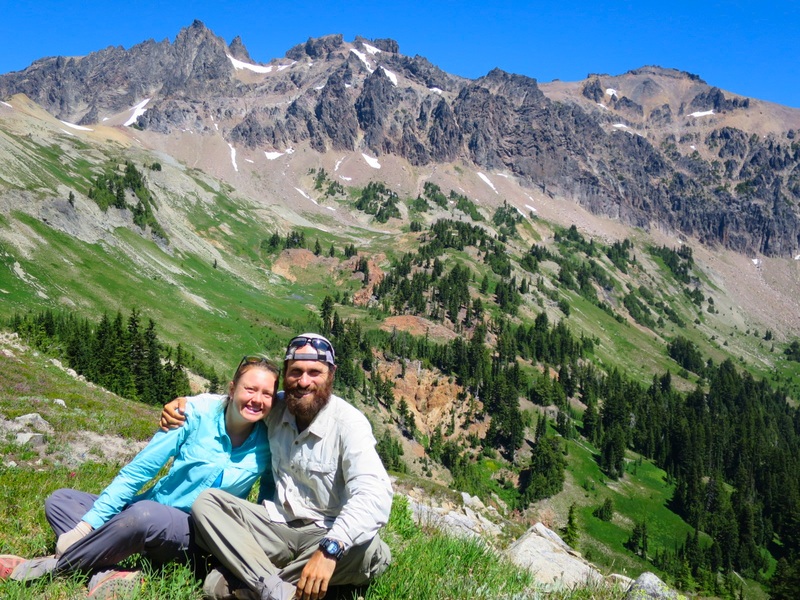 We have heard amazing things about the Goat Rocks Wilderness and couldn’t wait to see the beauty with our own eyes. We walked through the forest, gathering wetness from the plants and spider webs in the face. The mosquitoes were in full form so we hiked with our bug nets on. The mountains don’t give up their views that easily! We watched the ground as we walked to keep from stepping on frogs. 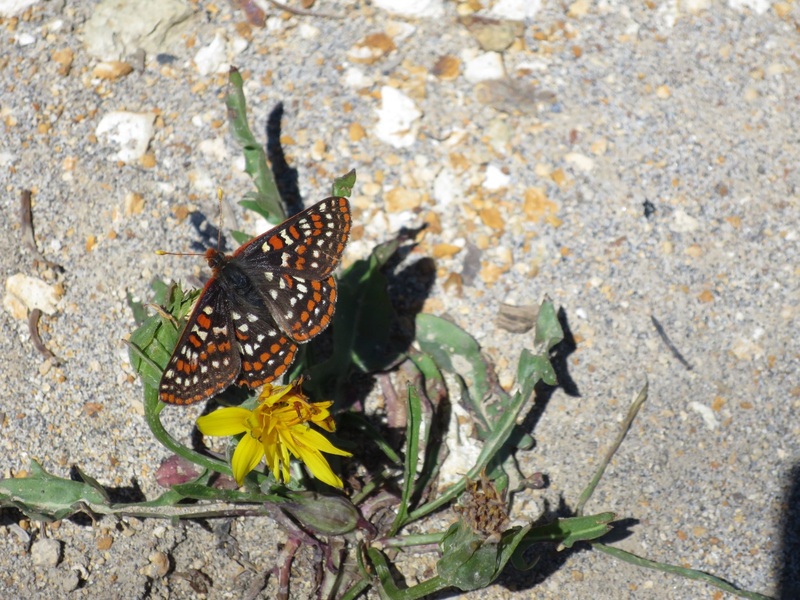 They would leap out into and off of the trail, blending in well with be sand and dirt. At one point Andy stopped abruptly. “Look!” He said as he pointed towards the ground. Thirty to fifty baby frogs hopped down and across the trail towards the uphill side. We have no idea where these frogs were going but there were lots of them traveling together in the same direction! We walked down through the forest, inhaling the fresh morning air. As we crossed small creeks we could almost taste the dampness. We climbed up the west side of a hill, appreciating the shade provided by the hill itself. We passed a handful of SOBOs, some more friendly than others but all said we were in for a treat! We caught glimpses of jagged dark rocks with patches of snow peering out above the hill to our right. On the left were mountains covered in green except for rocky out croppings. 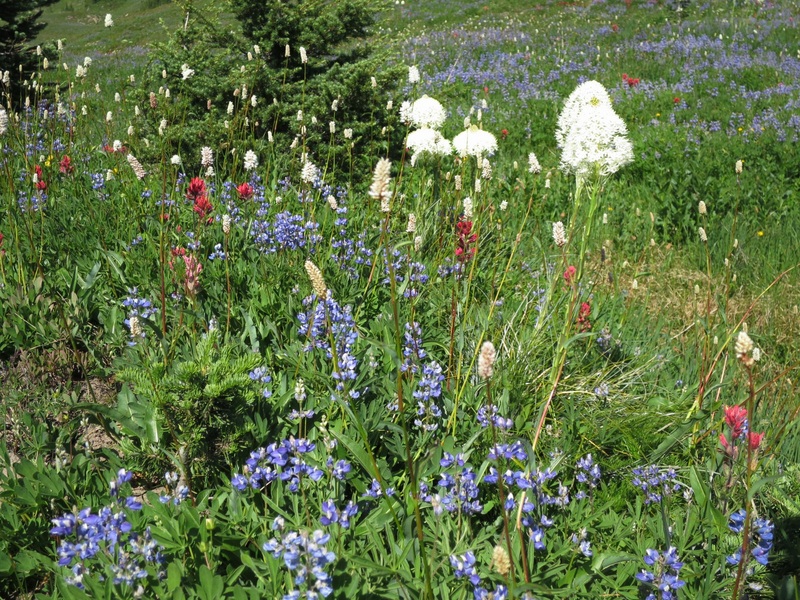 We hiked through meadows filled with wildflowers – lupine, paintbrush, columbine and many other white and yellow flowers littered the green hillside. As we crossed over a saddle our eyes widened. Before us was an expansive view of the aforementioned jagged peaks. A deep green valley extended to the right and we continued to traverse to the left up toward Cispus Pass. We took an hour long lunch break at the pass, taking in the view on either side. We felt so fortunate to be here on a clear and sunny day. We dropped down, stopping frequently to soak up the views. We crossed many small streams and got water at one just below a waterfall. We hiked on, passing many day hikers and overnighters heading into the area just below Cispus Pass. 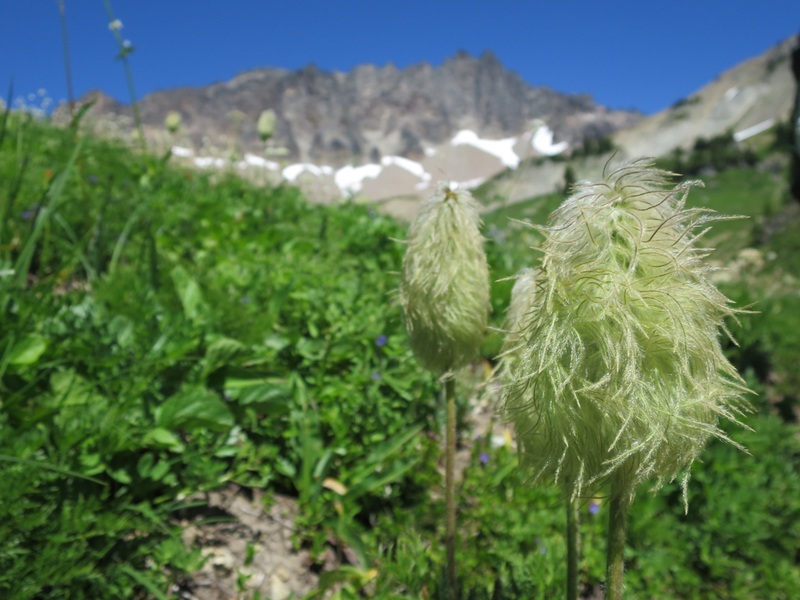 We walked through more fields of wildflowers, these with bear grass added to the mix. The colors of the flowers stood out against the green grass and dark gray and brown mountains. We felt like we were walking through paradise. We climbed up to a ridge and found a campsite on the edge. It had a rock wall built around it for protection from the wind. 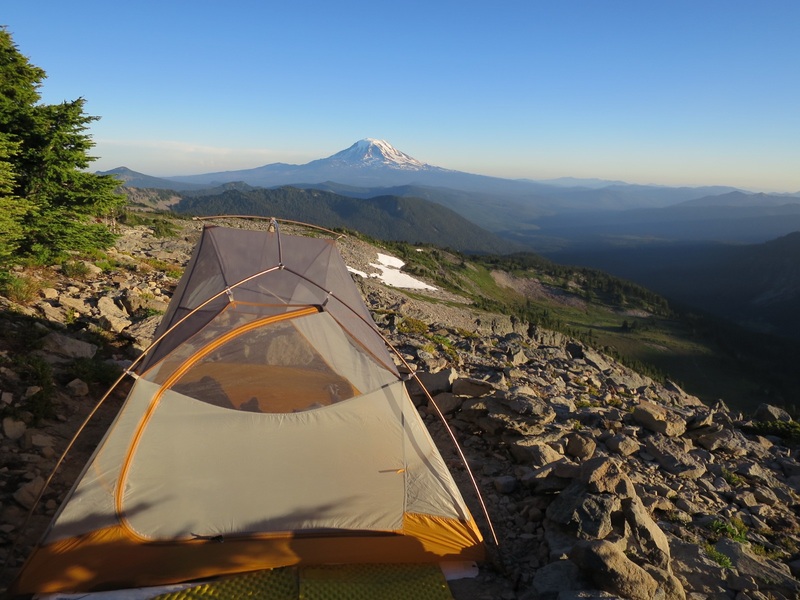 From our tent we had a fabulous view of Mt Adams and Mt St Helens. Within 10 ft either up or down the hill, we had a nice view of Mt Rainier too. We sat on the rocks below our campsite and ate cheese and carrot cake cookies (thanks GoRaw). Andy sewed the newest hole in Laurie’s hat and her gloves as Laurie blogged. 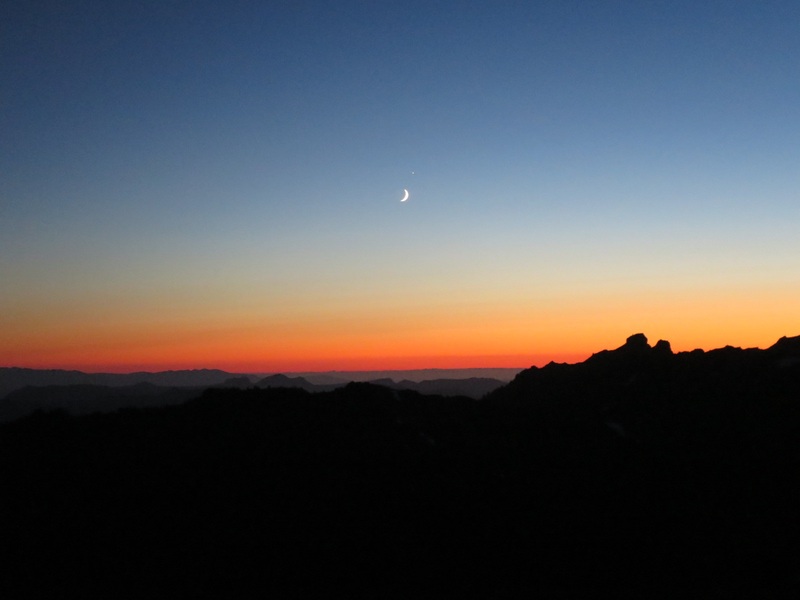 We ate dinner on the same rocks watching the golden light grace the western face of Adams. Two days ago we watched a similar show from a different location – 36 miles south to be exact. Today was pretty epic. Definitely the best day we have had on trail thus far. 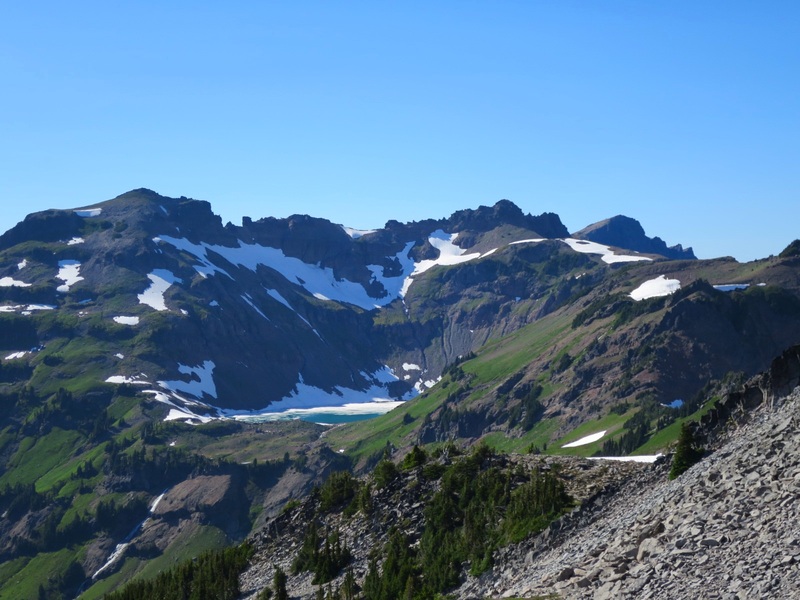 Many hikers say their favorite portion of the trail is either the Goat Rocks or the Sierra. We are enchanted with this area thus far and look forward to what tomorrow brings! 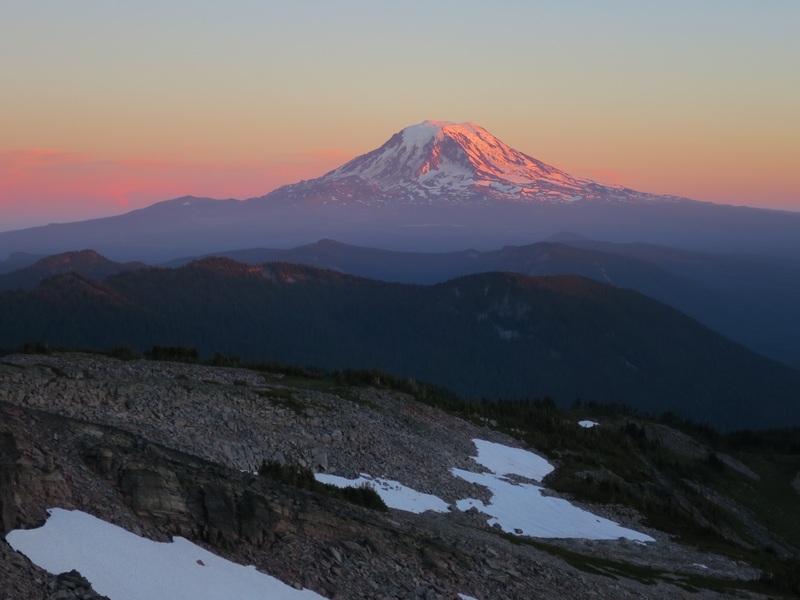 Tonight we are grateful for panaramic vistas and clear blue skies in Washington. 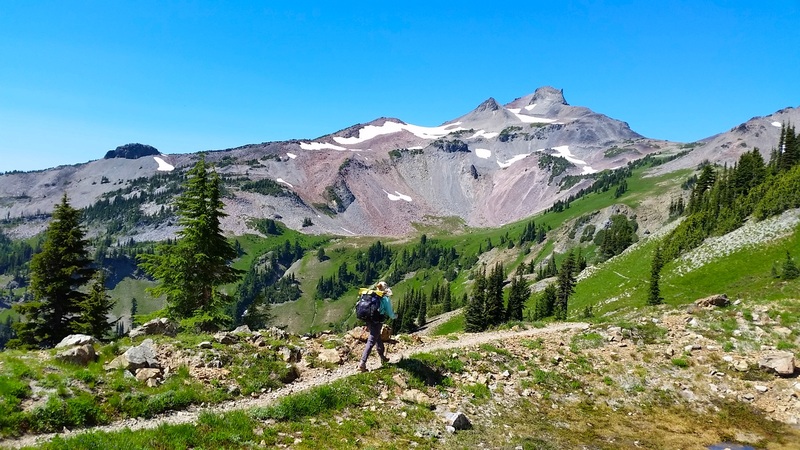 ← Day 123 – are we back in Oregon? Wow, those views of Rainier are incredible! Quick question, if you have time: If you are using water bladders to drink from, how do you gauge how much is left? Do you have to just physically take them out and check the level periodically? We keep our bladders in the side pockets of our backpacks so we can see how much water is left. Those wildflowers and views of Rainier are beyond beautiful. 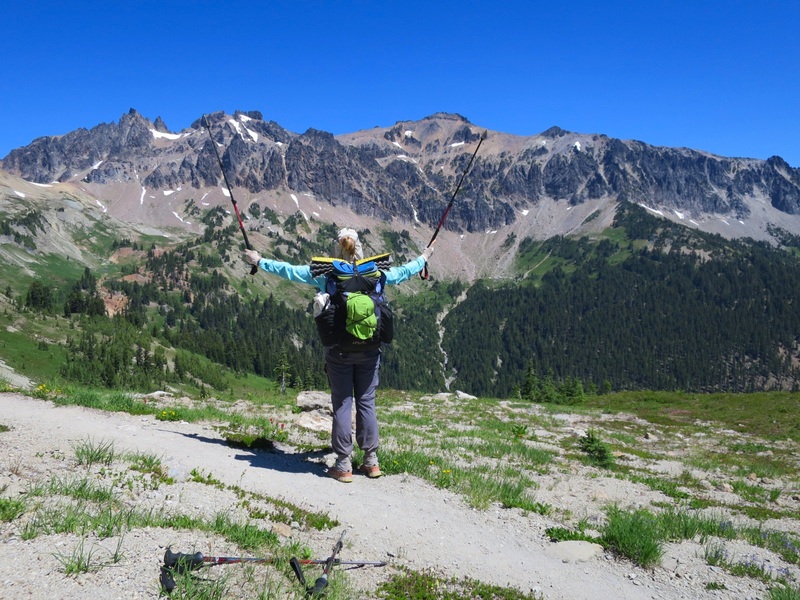 Laurie, you look just like your grandma and Mom with your walking sticks high in the air, looking at an amazing view. Such amazing photos. Thanks for sharing them with all of us. Amazing! You guys are in Washington. I am impressed. Keep up the great work. Thanks Kathy! We are looking forward to spending a night with Audrey, Mollie and Tim later this week! I have enjoyed your entire journey, but am really appreciating your last few posts because you are on trail I have hiked. 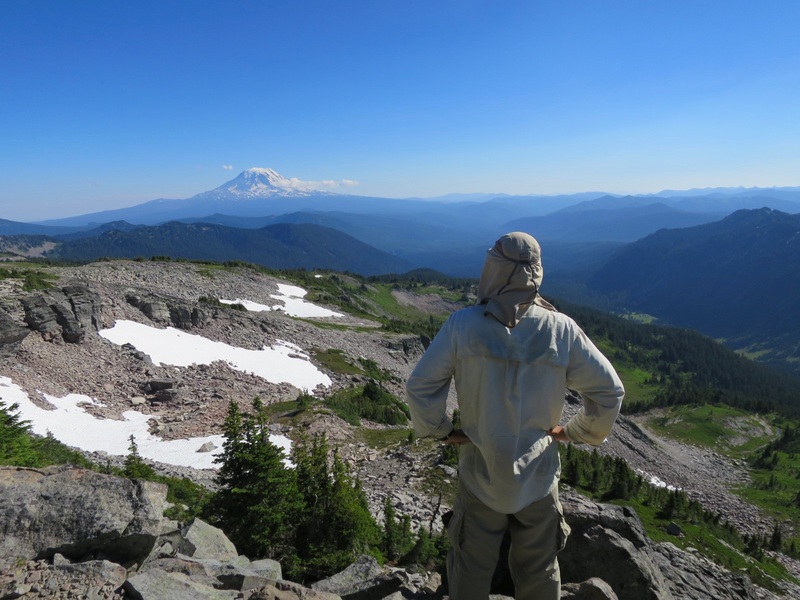 I can’t wait for your reaction to Old Snowy and the rest of the hike through Goat Rocks Wilderness. 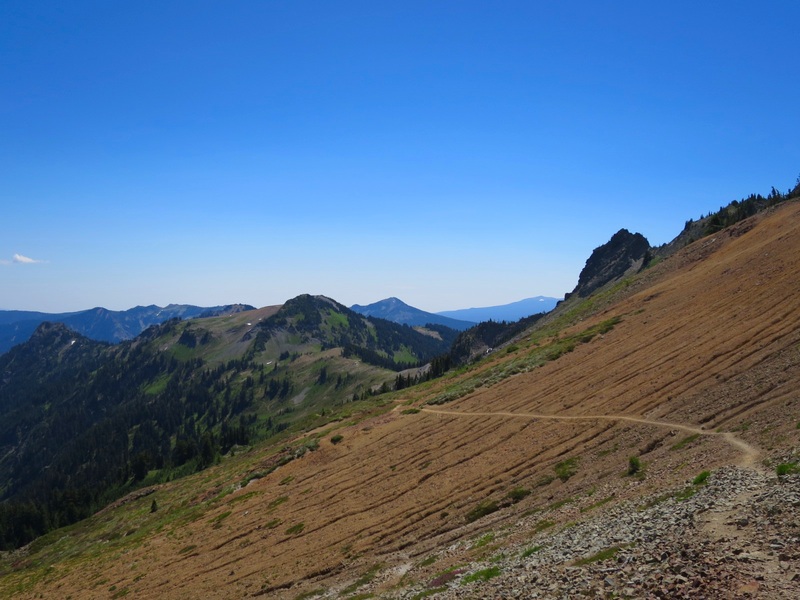 Glad you are having good weather on one of Washington’s most spectacular trails. You are doing a great job of savoring each day. I really appreciate the reminder. Once again, thanks for sharing your journey.